In a presentation, diagrams and other elements should appear in the center on various slides. But, this is not always accurate with a mouse and appears unprofessional during the presentation. 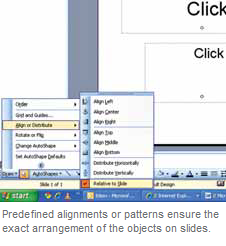 PowerPoint has integrated commands for automatic alignment of in the menu, but on the toolbar “Drawing” that can be faded in with “View | Toolbars | Drawing”. Position the necessary drawing on the slide and select it. Then click the “Draw” button in the drawing toolbar and open “Align or Distribute | Relative to slide”. You will then have to extend the menu by clicking the double arrow pointing downwards. When the “Relative to slide” option is active, all other commands will become active in this menu. You can now use the “Draw | Align or Distribute | Align horizontally” and “Draw | Align or Distribute | Align vertically” commands from the toolbar one after the other. The selected drawing element sets the correct combination of the individual commands at the borders or corners of the respective slide. Then use the commands “Flush left” and “Align bottom” to move the element exactly to the bottom left corner. You can support more complex requirements when aligning from the toolbar with the command “Draw | Grid and Guides”. In the next dialog, the “Snap objects to grid” option must be activated. In the grid settings, determine the spacing of the grid in the “Spacing” combination field. For usual tasks, 0.5 or 1 cm is mostly adequate. With that, a proportionate alignment is reliable. The maximum resolution is 0.1 cm. In this case, you should justify in an enlarged view so that the objects are aligned at the same grid line even later. Activate the “Display grid on screen” option and confirm the dialog with “OK”. Also pay attention to the fact that the grid always uses the left and top lines of the drawing element for alignment.